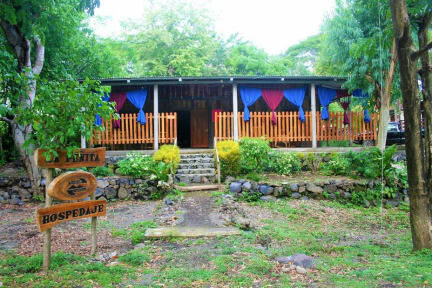 Hospedaje La Penita v Ometepe Island, Nicaragua: Zarezervujte nyní! 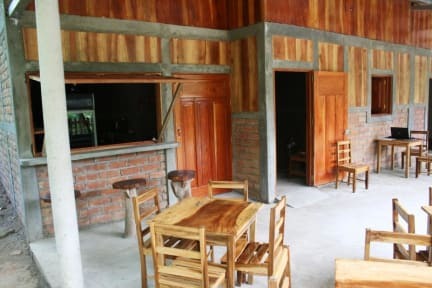 By visiting Hospedaje La Peñita, you are visiting a true 5th generation Ometepan family hostel. 3 generations contribute to making your stay one you won’t soon forget. Here, you can truly experience the laidback vibe of Nica life amongst the locals. Feel free to explore the island on your own or with a guided tour (that we will happily arrange for you upon request). the bus that stops near our hostel will take you wherever you want to go. 'Plate service' is offerd, this means mama Rosario will cook for you the best Nicaraguan mealsmeals on the island ! This consist of local, vegetarian or even veggie meals !! is also an option with us. It’s your vacation. We are here to help with your plans and welcome the chance to have you stay with us. The rooms are basic : a locker, mirror, AC 110Volt power connection, fan, double bed with linen, towel for shower and a quality lock on the door. The all have there one entrance. Lizzeth or Mark, mom( Rosario), dad( Francisco ), brother Dauglas or his wife Keyla.